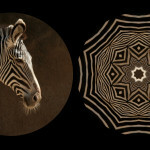 Urban Video Project (UVP) is pleased to announce the exhibition of the group show ‘Between Species’ Feb. 11-March 26. 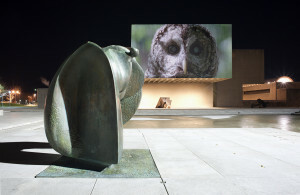 The exhibition will take place at UVP’s outdoor architectural projection venue at the Everson Museum of Art. 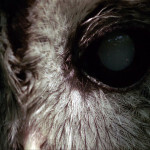 Urban Video Project (UVP) and parent organization Light Work, in collaboration with the Everson Museum of Art, are pleased to announce the exhibition of “Between Species” a group show of short video works exploring the idea of “the animal” and attempts to imagine and engage with nonhuman animals through visual technologies. “Between Species” features work by artists Leslie Thornton, Sam Easterson, Maria Whiteman and Robert Todd. The exhibition will take place at UVP’s outdoor architectural projection venue onto the north façade of the Everson Museum of Art from Feb. 11-March 26, every Thursday through Saturday from dusk to 11 p.m.
A related indoor screening featuring additional works and a panel talk featuring artist Maria Whiteman and theorist Cary Wolfe will take place on March 10 in the Everson Museum of Art’s Hosmer Auditorium. This event is free and open to the public. A reception will follow. This exhibition will be the fourth installment of “We Were Never Human,” a year-long program of exhibitions and events at Urban Video Project and partner organizations exploring the shifting idea of what it means to be human, feature the work of established and emerging artists who explore the shifting idea of what it means to human, the notion of posthumanism and encounters with the nonhuman. Easterson is an award winning video artist with over a decade of experience collecting wildlife imagery for museum, web and television venues. Past venues include the Whitney Museum of American Art (Biennial), the Exploratorium, dOCUMENTA (13), Discovery Channel, the International Center of Photography, The Learning Channel, the New Museum of Contemporary Art, the Late Show With David Letterman (CBS), MASS MoCA, MTV, the Walker Art Center and Animal Planet, among others. Select press: Newsweek, NPR, The New York Times, CNN, The LA Times, Harper’s, Audubon Magazine and The New Yorker, among others. Easterson is a graduate of The Cooper Union for the Advancement of Science and Art in New York City. Thornton’s rigorously experimental film and video work draws from archival material, texts, found footage and dense soundtracks. Exploring the aesthetics of narrative form as well as the politics of the image, Thornton forges a unique and strangely beautiful syntax, one that poses its critique at the same time that it mesmerizes and confounds. Todd is a lyrical filmmaker as well as a sound and visual artist. In the past 20 years he has produced a large body of short- to-medium-format films that have been exhibited internationally at a wide variety of venues and festivals, including the Media City Festival, San Francisco International Film Festival, Rotterdam International Film Festival, New York Film Festival, Le Rencontres Internationale, Black Maria Film Festival, Nouveau Cinema in Montreal, Cinematheque Ontario, the Harvard Film Archive, the Paris Biennial and others. His films have won numerous festival prizes, grants and artist’s awards. He teaches film production at Emerson College in Boston. Whiteman’s current art practice explores themes such as art and science, relationships among industry, community and nature, and the place of animals in our cultural and social imagery. In addition to her studio work, she conducts research in contemporary art theory and visual culture. Whiteman has published critical texts in Public: Art/Culture/Ideas, Minnesota Review and Antennae and an essay on Visual Culture in the John Hopkins Guide to Literary Theory and Criticism. In 2011, Whiteman was a recipient of an Interdisciplinary Course Seminar Grant from the Kule Institute for Advanced Studies and was a scholar in the Canadian Institute for Research Computing in the Arts. In 2011, she had a solo exhibition at Latitude 53. She exhibited in the Alberta Biennial at the Art Gallery of Alberta 2013. Whiteman was a co-director of the 2012 (BRIC) Banff Research in Culture/ documenta 13 research residency and participated in the Geoffrey Famer Residency at the Banff Centre in 2012. She has been presenting conference papers and exhibiting artworks at the SLSA 2012-2015. She has also been selected as a recipient of the Visiting Scholar Lynette S. Autrey Fellowship 2015-2016. Urban Video Project (UVP) is an important international venue for the public exhibition of video art. UVP is a multimedia public art initiative of Light Work and Syracuse University, operating on the Connective Corridor cultural strip in Syracuse, N.Y. UVP Everson, UVP’s flagship site located at 401 Harrison St. in downtown Syracuse, is made possible through a generous partnership with the Everson Museum of Art. UVP thanks Onondaga County and the Connective Corridor, Syracuse University, and New York State Council on the Arts. 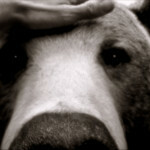 The associated screening and talk for “Between Species” is co-sponsored by the Central New York Humanities Corridor. Exhibitions are screened onto the north façade of the building and are visible from the plaza every Thursday-Saturday from dusk to 11 p.m. The permanent public art venue includes an all-seasons, extra-large venue projector and stereo sound system. All UVP programs are made possible through the generous support of the New York State Council on the Arts.